The Greater Western Sydney GIANTS are pleased to announce Tim Schmidt as the inaugural senior coach of the GIANTS’ National Women’s League team. The former AFL player has been working with AFL NSW/ACT as Female Football High Performance coach and has been instrumental in the launch of the first ever Female AFL Academies in Canberra, Wagga Wagga, Sydney and Newcastle. Chief Executive Officer David Matthew said Schmidt’s appointment is a significant development for the new team. “We’re pleased to appoint Tim to this position and he comes to our club with a wealth of experience, expertise and passion for women’s football,” Mr Matthews said. “His impressive coaching credentials and work in this space made him an ideal candidate for this crucial role at the GIANTS. Since retiring from the AFL in 2009 following a series of injuries, Schmidt founded an elite kicking and skills academy which has worked with some of the most talented young players in both the GIANTS and the Swans Academies. 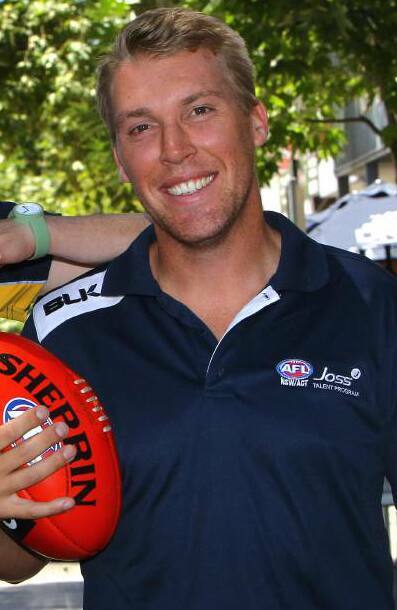 The 30-year-old has been heavily involved in AFL coaching with the NSW/ACT National Youth Girls team and the Swans Academy and also worked with the Sydney Roosters in the NRL, the Sydney Hills Eagles in the NEAFL and the NSW/ACT Rams in the NAB AFL Under-16 National Championships. Schmidt was drafted to the Sydney Swans in 2003 with pick 29 and played 17 AFL games over six seasons. Schmidt said he is excited to join the GIANTS as National Women’s League senior coach. “The National Women’s League is a huge step forward for the AFL and I’m proud to be part of the inaugural competition with the GIANTS,” Schmidt said. “I’ve admired the way the GIANTS have built a strong reputation on and off field over the past five years and this is a really exciting opportunity to be part of a historic new competition.